The colder weather is always the perfect time to kick your feet up by the fire and cozy up with a warm, comforting soup. 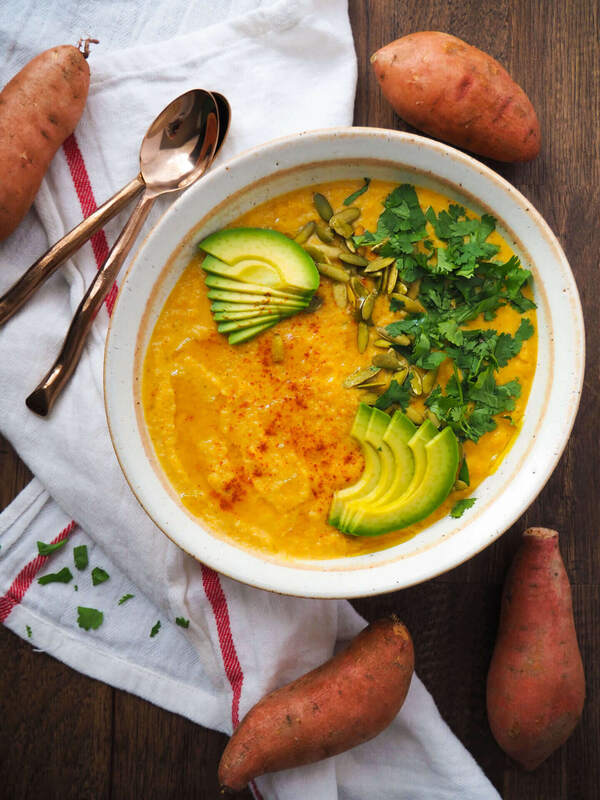 This roasted cauliflower sweet potato soup is just what you need to do that, and is packed with nutritious ingredients too! Spread cauliflower and sweet potatoes on two separate large baking sheets. Drizzle each with a tablespoon of olive oil, season with salt and freshly cracked black pepper and toss to combine. Place in the oven and roast 25-30 minutes until tender and golden. Remove and set aside. When vegetables have roasted, heat remaining tablespoon olive oil in a large pot on medium-high heat. Add onions and saute until translucent, about 5 minutes. Add garlic and cayenne and saute 60 seconds. Stir in roasted vegetables and pour in 6 cups of broth. Bring to a boil, reduce heat and simmer 5-10 minutes. Remove pot from heat and pour in half and half. Using an immersion blender, carefully puree soup. If a thinner consistency is desired, add more broth. Taste and season with salt and pepper.